[prMac.com] Denia, Spain - Maxprog is proud to present a new release of its bulk email software, MaxBulk Mailer, available now on Maxprog website with several interesting new features and improvements. MaxBulk Mailer is a bulk email software and internet marketing tool for macOS and MS Windows that supports plain text, HTML and rich text formats including optional plain text alternative and attachments. It includes document and contact management, support for multiple lists and remote lists, multiple accounts with POP and ESMTP authentication, SSL, groups, mySQL and postgreSQL imports, unicode support, double opt-in list subscription manager and message opening/click-through tracking, 40 encoding for virtually any language and hundreds of exclusive features. MaxBulk Mailer is available in English, German, French, Spanish, Italian, Swedish, Russian, Chinese, Japanese, Korean, Dutch and Portuguese for macOS 10.7 and Windows 7 (or higher). Maxprog has created the ultimate tool for all of the email marketing needs. MaxBulk Mailer allows the user to design and send professional looking emails to customers and prospects for as little as fractions of a penny. MaxBulk Mailer is a powerful mail-merge tool that allows to send out customized press releases, price lists and any kind of text or HTML documents. MaxBulk Mailer is fast, fully customizable and very easy to use. MaxBulk Mailer handles plain text, HTML and styled text documents and gives full support for attachments. Here is a breakthrough tool from Maxprog that will allow marketers to increase profits, strengthen customer service and sending messages to new markets. With MaxBulk Mailer the user can create, manage and send powerful, personalized marketing messages to customers and potential customers. MaxBulk Mailer also includes a double opt-in list subscription manager and offer message opening and click-through tracking. MaxBulk Mailer is a software tool that you purchase once, no need to pay on a per-email basis to submission services. 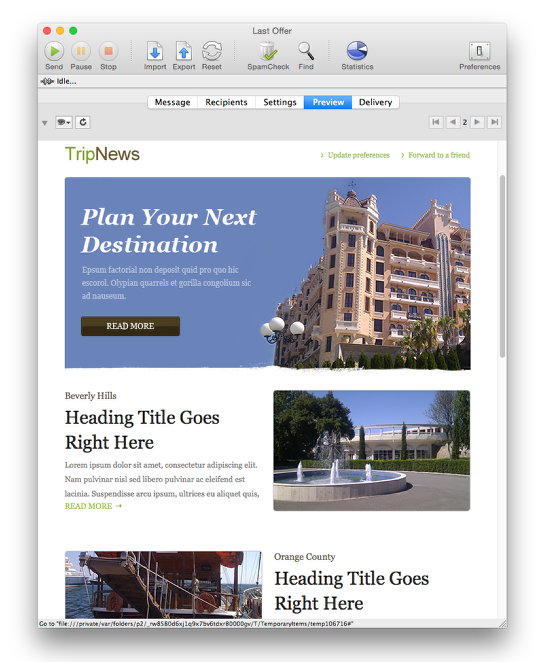 Now promotional messages will jump off the screen with HTML email! MaxBulk Mailer HTML allows the use of graphics, fonts and colors turning messages into professional online brochures. Any user can utilize their full lists of contact information with MaxBulk Mailer reaching everyone in the database without worrying about integration or compatibility issues. Max Programming, LLC also known as Maxprog(R) is a privately held company dedicated to macOS, MS Windows and Linux software development. Max Programming mainly develops and markets Internet, communication and database tools. Max Programming was founded in the early nineties by French-born programmer Stanley Roche Busk, after over 15 years of experience in the high-tech networking industry and computer software development, now Chief Executive Officer of the company. Since its creation, Max Programming has built firm business relations with thousands of clients from over 136 countries with products localized in up to 14 different languages like English, French, German, Spanish, Italian, Russian, Japanese, Chinese, Dutch, Swedish and Portuguese. English is our primary language. Copyright (C) 2002-2016 Max Programming, LLC - All rights reserved. Other trademarks and registered trademarks may be the property of their respective owners.